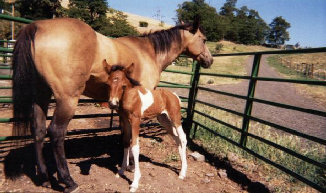 "Painted Princess " is a curly filly born 6-24-01. Her Dam is CVC Crescendo ABC P-1827(f) Buckskin mare and her Sire is M.R. A Keeper ABC P-2376 Buckskin pinto. Princess is a tri-colored Tobiano buckskin pinto with very long stockings on her front and back. Her tail is buckskin, black and white. Princess will most likely mature to 14+ HH, somewhere in mid range. Her Dam is an excellant mother and Princess should be an excellant broodmare. This filly has a super soft curly coat and a big curl in her mane and tail, she also has that" look at me" attitude that will make her a real jewel in the curly world. Add some color to your herd with this filly !!! Princess will sell for $2500.00 Contact us for more info.